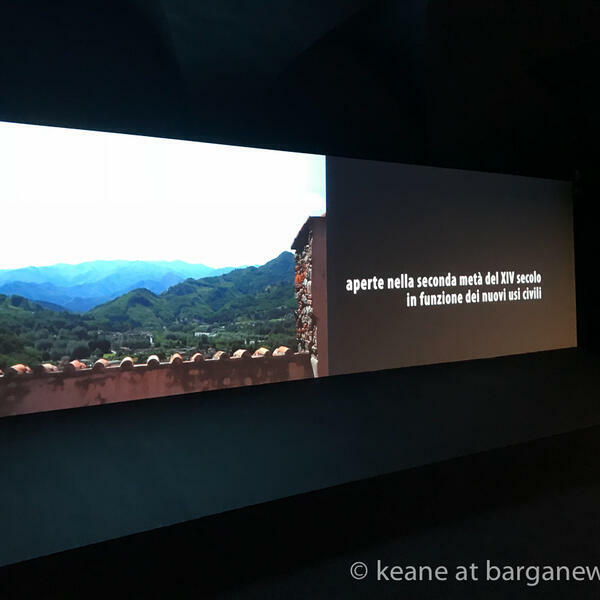 Today the 9th December 2017, the second room of the Multimedia Museum of the Rocche e Fortificazioni della Valle del Serchio - Rocche and Fortifications of the Serchio Valley opened to the public in the Volta dei Menchi in Barga Vecchia. The museum was opened in 2015 (article here) and according to well informed sources, 4 million euro was initially spent and another 2 million later on an ambitious project the “Bacino Culturale della Valle del Serchio” – a multimedia virtual museum of the castles, fortresses, walled villages and medieval bridges of the Serchio Valley – Museo multimediale delle Rocche e Fortificazioni della Valle del Serchio. The project has been funded by public money and by the Fondazione Monte Paschim di Siena and Fondazione Cassa Risparmio di Lucca, ARCUS SpA in collaboration with the University of Pisa.